The Fed’s definition of income includes jobless benefits for the unemployed. Unemployment rates exceeding 9 percent pulled down median incomes across all ages of the working population, compared with historically low rates at the beginning of the decade. But the percentage declines in income are dramatic and may point to a larger trend. The Fed conducts its survey every three years and asks Americans to report incomes during the past year. Income also includes wages, salaries, Social Security, business incomes, and even realized gains and losses from stock and bond sales and capital gains from home sales, among other sources. Older workers in their prime working years experienced income declines due to either unemployment or, for those with jobs, stagnating or reduced wages during the decade. 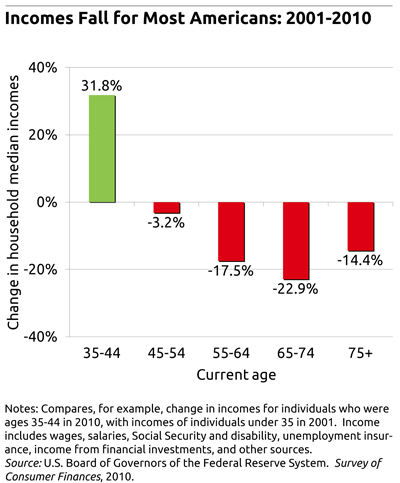 Incomes for people approaching or entering retirement – ages 55 through 64 – changed little. In contrast, retirees appear to be slightly better off, possibly partly due to the recent rebound in the stock market and the accumulation of income-generating financial assets by their working wives. 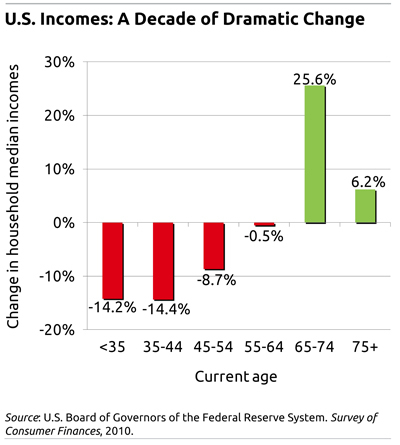 The Fed’s income data, looked at a different way in the chart below, paint a less rosy picture for the oldest Americans. This second chart indicates that median incomes overall are declining. But unlike the previous chart, this one shows how Americans have done as they have aged and reinforces that people who should be in their prime earning years were hit hard over the past decade. For example, workers who are currently 55 through 64 reported a median income of $55,100 in 2010 – that’s 18 percent lower than nearly a decade ago. In the 2001 Fed survey, roughly this same group – they were 45 through 54 at the time – reported median income of $66,800. The largest decline – nearly 23 percent – for people from 65 through 74 is probably not surprising, however. All but the wealthiest retirees typically experience a big drop in earnings when they leave the workforce; living standards don’t necessarily decline, because retirees pay lower taxes and reduce other expenses. Americans age 35 through 44 countered the trend: their incomes rose by 32 percent over the past decade. They were old enough to get a foothold in the labor force prior to the 2008 recession. But for most Americans, it’s not a pretty picture no matter how you look at the data. Hats Off. Awesome analysis and research. This is really a major concern. This is going to become more and more true for young people who had to take out loans to fund their college education. Student loan amounts are the highest they have ever been. This will effect the amount that young people get to save once they are done with college and starting a job. Excellent analysis. Besides, I am not surprised by the results. My parents are quite practical in their savings and budget formation. Even in the times of recession they had enough money to cover all the expenses and to save a little amount of money.